Are you coming to ski in Arinsal? Is it your first ski holiday? Well, the first thing we want to clarify is that you must know that skiing is not all about skiing. There are many other things that will make your holiday a top experience. And of course, one of the most important is the “après-ski”, which means, take a beer after skiing or recover strength eating a good fondue, or a pizza, to return to the slopes the next day with more energy. 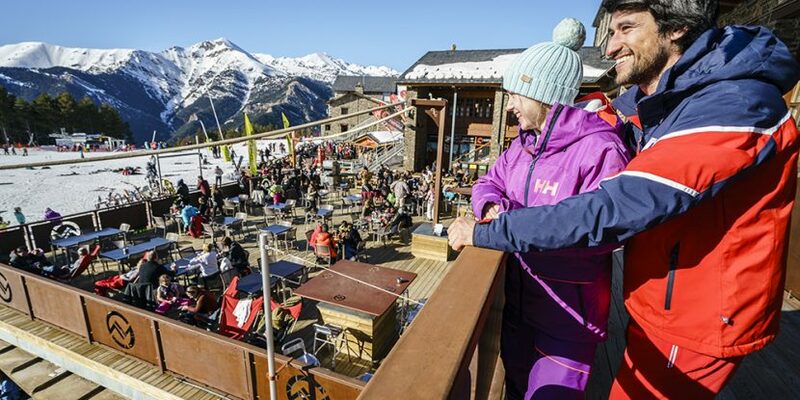 That’s why we’ve made a list of the restaurants and bars you can find in Arinsal, depending on what you like, so you know where to go once you arrive in resort. In the village, there are endless options and you will see that the opening hours are quite long, many restaurants open all day and close late after 22:00. Tell us what you are looking for and we will let you know where to go. If you love cheese, you cannot leave Andorra without trying the famous fondue, and 360 is the best place for this in Arinsal also includes vegetarian options. In addition, the restaurant is located next to the river level and you can enjoy the 2 for 1 après-ski beer on their sunny terrace. For the party lovers, we recommend Ciscos bar & restaurant. Their Mexican plates, friendly atmosphere and great cocktails (or the famous sangria) mean that Ciscos is undoubtedly the best for a night out. What music do you like? On Tuesdays and Sundays you will be able to dance to the Latin rhythms, Wednesdays it is Bollywood night and Fridays and Saturdays the techno music reigns in the DJ’s cabin. There is a night for everyone here! If on the other hand, you are looking for a quieter place to surprise your partner, we love El Cabin. Upon entering you will feel like you are being immersed in a forest thanks to its decoration full of wood. The atmosphere is very relaxed here. If you go during the day we recommend you to sit outside on their terrace by the river to take advantage of the sun’s rays while you have a drink. This Irish pub is the perfect place to go for a pint, watch a football game, play pool or football table, but above all enjoy their live music nights! The atmosphere is amazing, and it is a place where you will never get bored. Karaoke nights on Wednesdays are one of our favourites. Also, if you get hungry, you can have nachos, pizzas, or any snack that fill you up. Both restaurants have the same owner, and if you just want to get a quick meal, an empanada or pizza from Fugazzeta or a Burger from Factory, this is your for you. We love the decoration of Factory, and the pizzas are good and a great price. You can download the discount vouchers here! If you are skiing on the slopes of Arinsal there are also options where you can rest to stretch your legs and eat something. Polar Bar: We love it because every day they change the dish of the day and while you eat it on the terrace you can see people skiing down Les Fonts run. Also, if you download our vouchers you will have a 10% discount when you order. Don’t forget to download your vouchers here before you go. We have worked with some great suppliers to put together amazing savings for you!